Mrs Namgyal Lhamo Taklha, author and renowned Tibetan figure, who is also former Health Secretary of Central Tibetan Administration, released the first-ever work of documentation of traditional Tibetan costumes and jewellery. The book titled ‘Costume and Jewellery of Tibet’ was released by President Dr Lobsang Sangay, Central Tibetan Administration during a launch ceremony held at Tibet Museum on Wednesday. The event was also attended by Secretary Tenzin Dhardon Sharling (Equivalent), Department of Information and International Relations, Secretary Tenzin Lungtok of Department of Religion and Culture, Additional Secretaries of DIIR and a host of Tibetan intellectuals, writers, journalists and prominent personalities. 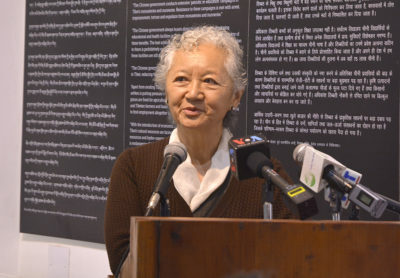 Speaking at the event, Ms Namgyal Lhamo said she first conceived the idea of the book in 1998 when Gabriel Lafitte, a Tibetan research scholar presented her with a book on Mongolian costumes. “His gift made me realise that there are many Tibetan costumes in museums all over the world, but no books on the subject, so I decided to compile one,” the author said. She said the book has been enriched with the exquisite knowledge shared by the elder Tibetan generation, many whom shared thorough details of traditional Tibetan costumes. “It has been 15 years in the making of the book”. The author hoped that the book will serve as a treasure house of information for young Tibetans to enable them to learn about their rich cultural traditions that are now disappearing. Mrs Taklha recounted how she visited the vast study and research articles on costumes and materials by scholars in Tibet and collected as much reliable information as possible about Tibetan costumes from before 1959. President Dr Lobsang Sangay offered the book as an essential contribution to preservation efforts and representation of the rich and distinct identity, culture, writing, costumes, the tradition of Tibet. “While inside Tibet, systematic efforts are being made to sinicise the Tibetan culture, people, their religious and social life, this book will serve a great purpose in presenting the unique identity of the people of Tibet which is so well preserved in the book,” he said. The 183-page book presents rare photos of early records of Tibetan costumes, Tibetan textiles, costumes of the people of three provinces of Tibet, costumes of Tibetan government officials, Oracles, Opera and Cham and of jewels, hairstyles and ornaments.